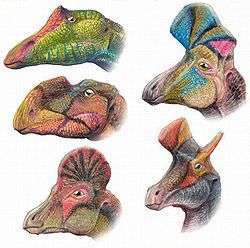 Ornithopods (/ɔːrˈnɪθəˌpɒdz, ˈɔːrnɪ-/) or members of the clade Ornithopoda (/ˌɔːrnɪˈθɒpədə/ or /ɔːrˌnɪθəˈpoʊdə, ˌɔːrnɪ-/) are a group of ornithischian dinosaurs that started out as small, bipedal running grazers, and grew in size and numbers until they became one of the most successful groups of herbivores in the Cretaceous world, and dominated the North American landscape. Their major evolutionary advantage was the progressive development of a chewing apparatus that became the most sophisticated ever developed by a non-avian dinosaur, rivaling that of modern mammals such as the domestic cow. They reached their apex in the duck-bills (hadrosaurs), before they were wiped out by the Cretaceous–Paleogene extinction event along with all other non-avian dinosaurs. Members are known from all seven continents, though they are generally rare in the Southern Hemisphere. Ornithopoda means "bird feet", from the Greek ornithos ("bird") and pous ("feet"); this refers to their characteristic three-toed feet, although many early forms retained four toes. They were also characterized by having no armour, the development of a horny beak, an elongated pubis that eventually extended past the ilium, and a missing hole in the lower jaw. A variety of ornithopods and related cerapods had thin cartilaginous plates along the outside of the ribs; in some cases, these plates mineralized and were fossilized. The function of these intercostal plates is unknown. They have been found with Hypsilophodon, Othnielosaurus, Parksosaurus, Talenkauen, Thescelosaurus, and Macrogryphosaurus to date. The early ornithopods were only about 1 metre (3 feet) long, but probably very fast. They had a stiff tail, like the theropods, to help them balance as they ran on their hind legs. Later ornithopods became more adapted to grazing on all fours; their spines curved, and came to resemble the spines of modern ground-feeders such as the bison. As they became more adapted to eating while bent over, they became semi-quadrupedal; still running on two legs, and comfortable reaching up into trees; but spending most of their time walking or grazing while on all fours. The taxonomy of dinosaurs previously ascribed to the hypsilophodontidae is problematic. The group previously consisted of all non-Iguanodontid bipedal ornithischians, but a phylogenetic reappraisal has shown such species to be paraphyletic. As such, the hypsilophodont family is represented only by Hypsilophodon. Later ornithopods became larger, but never rivalled the incredible size of the long-necked, long-tailed sauropods that they partially supplanted. The very largest, such as Shantungosaurus, were as heavy as medium-sized sauropods at up to 23 metric tons (25 short tons) but never grew much beyond 15 metres (50 feet). Artist's impression of several species of iguanodontians, in profile. Historically, most indeterminate ornithischian bipeds were lumped in as ornithopods. Most have since been reclassified as basal members of typically quadrupedal taxa such as Marginocephalia; and some, such as the "bone-headed" pachycephalosaurids, have been given their own taxa. Ornithopoda is usually given the rank of Suborder, within the order Ornithischia. While ranked taxonomy has largely fallen out of favour among dinosaur paleontologists, some researchers have continued to employ such a classification, though sources have differed on what its rank should be. Benton (2004) placed it as an infraorder within the suborder Cerapoda (originally named as an unranked clade), while others, such as Ibiricu et al. 2010, have retained it at its traditional rank of suborder. The cladogram below follows a 2009 analysis by Zheng and colleagues. Cladogram after Butler et al, 2011. ↑ "ornithopod - definition of ornithopod in English from the Oxford dictionary". OxfordDictionaries.com. Retrieved 2016-01-20. ↑ See analogous pronunciation of "gastropoda - definition of gastropoda in English from the Oxford dictionary". OxfordDictionaries.com. Retrieved 2016-01-20. ↑ Butler, Richard J.; Galton, Peter M. (August 2008). "The 'dermal armour' of the ornithopod dinosaur Hypsilophodonfrom the Wealden (Early Cretaceous: Barremian) of the Isle of Wight: a reappraisal". Cretaceous Research. 29 (4): 636–642. doi:10.1016/j.cretres.2008.02.002. ↑ Calvo, J. O.; Porfiri, J. D.; Novas, F. E. (2007). "Discovery of a new ornithopod dinosaur from the Portezuelo Formation (Upper Cretaceous), Neuquén, Patagonia, Argentina.". Arquivos do Museu Nacional. 65 (4): 471–483. ↑ Weishampel, D. B. & Heinrich, R. E. (1992). "Systematics of Hypsilophodontidae and basal Iguanodontia (Dinosauria: Ornithopoda)". Historical Biology. 6 (3): 159–184. doi:10.1080/10292389209380426. ↑ Zheng, Xiao-Ting; You, Hai-Lu; Xu, Xing; Dong, Zhi-Ming (19 March 2009). "An Early Cretaceous heterodontosaurid dinosaur with filamentous integumentary structures". Nature. 458 (7236): 333–336. doi:10.1038/nature07856. PMID 19295609. Ornithopoda, by Justin Tweet, from Thescelosaurus! GEOL 104 dinosaurs: a Natural history, ornithopoda: beaks, bills & crests, by Thomas R. Holtz, Jr.